Sarna, professor of American Jewish history, delved into diaries, letters, newspaper accounts and other sources to provide what a writer for The Jewish Chronicle called “a full, unvarnished account” of the worst anti-Jewish discrimination incident in U.S. history: General U.S. Grant’s expulsion of Jews from the territory under his command. The 1862 action created waves of outrage across the land and was rescinded by President Abraham Lincoln, but it took an emotional toll on the U.S. Jewish community and haunted Grant throughout his political career. Carly Fleischmann attends classes for the gifted in a Toronto high school. But severe autism, diagnosed when she was 2, makes her different from most teens — different, even, from her twin sister, Taryn. For starters, she can’t speak — at least, not in the usual way. Here, her dad, an advertising executive, shares their family’s journey as Carly broke through perceived barriers to find an inner voice that has inspired an online audience at carlysvoice.com and on national TV in Canada and across the United States. Plamper, a fellow at Berlin’s Max Planck Institute for Human Development, is hardly the first to label Stalin’s following a cult. Supporters of the Soviet leader not only paved his way to terrifying power, but honored him in what this richly illustrated book calls “a torrent of portraits, posters, statues, films, plays, songs and poems.” Using previously untapped Russian archives, Plamper places these phenomena in a wider cultural context, drawing parallels to personality cults that formed around Napoleon III, Mussolini, Hitler and Mao. Modern readers have a taste for quantifying, so it was inevitable an author would capture contemporary political thought in a top-10 list. Lakoff, founding chair in political science at the University of California, San Diego, simplifies the “big ideas” into chapters on Christianity and Equality; Civic Humanism; Liberalism; Conservatism; Socialism; Nationalism; Fascism; Realism in Foreign Policy; Islamism; and Democracy. Reviews praise the text for its accessibility and its ability to inspire critical thinking. The exhibition catalog from Boston University’s Stone Gallery features an essay and 17 plates showing views of urban subject matter created by Hurwitz over a 50-year span. Etchings and watercolors of bridges, smokestacks, train trestles, factories and steelworks evoke a vital industrial age. Born in 1932, the celebrated artist and teacher attended Worcester Art Museum’s school before coming to Brandeis; after graduating, he studied art in Germany, at BU, and at the Skowhegan School of Painting and Sculpture in Maine. Think civil rights era and you’re thinking about the 1960s. But Miller takes us back decades earlier to a 1933 meeting held in tents outside rural Amenia, N.Y. The little-recalled assembly, staged by NAACP head Joel Spingarn to revitalize the organization, brought pioneers like W.E.B. Du Bois together with a new generation of black intellectual leaders that included youth activist Juanita Jackson, diplomat Ralph Bunche, economist Abram Harris, lawyer Louis Redding and Harlem organizer Moran Weston, all profiled here. First came pay it forward, then random acts of kindness. Now Jewish community leader Cohen brings a new spin on generosity. In this sweet book, she tells of recovering from her dad’s death through acts of giving. While the title is Hebrew, Cohen’s suggestions are universal. Chances are you’re already following some of them: praise people for work they do, pass a book along to a friend, give someone else’s kid a ride home, clean your house of worship, call on an older neighbor, thank a teacher, scoop your dog’s poop. This update of a 2008 title tells when, how and why to enter independent law practice — and what to look out for. Special sections cover deciding to go solo, planning the launch, organizing and running a practice, and marketing your solo firm. A popular law blogger, Elefant has a successful Washington, D.C., practice focusing on energy regulatory and enforcement law, appellate law and marine renewable energy. The book, which also includes profiles of solo lawyers, was Amazon’s top-ranked law career title in December 2011. An outgrowth of Small’s dissertation at the University of Michigan, where she earned a Ph.D. from the Center for the Study of Higher and Postsecondary Education, this book takes on the ambitious task of allowing college students to tell, in their own words, what their faith means to them and why it is important that universities foster a diversity of religious expression on their campuses. The author gathered data from Protestant Christian, Jewish, Muslim and atheist students in focus groups, questionnaires and interviews. Ducks scrub and sweep. They make mush. They burp. They even hug and kiss. And, while they’re at it, they teach preschoolers how to read about ducks. With its simple, rhyming words and humorous cartoon illustrations by Viviana Garofoli, “Ducks Go Vroom” is at the lowest, “Ready to Read,” level of the Random House series “Step into Reading.” Also the author of “Etsie the Mensch,” Kohuth holds a master’s degree in theological studies from Harvard. Webster’s defines a mensch as a good person, and that’s what Etsie is told to be, though she prefers sometimes to be a chimp, an octopus, a turtle or an ostrich. But after making friends with a friendly and good-humored little boy at the zoo, she performs an act of kindness that makes her realize being a person — well, being part person — is not so bad. Text by Kohuth (also the author of “Ducks Go Vroom”) is accompanied by the colorful illustrations of Rosanne Litzinger. The depiction of Jews in film hits more bases than “Fiddler on the Roof,” Mel Brooks and an angst-ridden Woody Allen. Baron compiles 54 essays covering everything from the history of the Dreyfus affair to “Torch Song Trilogy,” “Garden of the Finzi-Continis” to “Crossing Delancey.” Silent ghetto film, Holocaust stories, Yiddish talkies, contemporary Israeli experience, anti-Semitism and Jewish women of America’s postwar middle class are examined in turn. 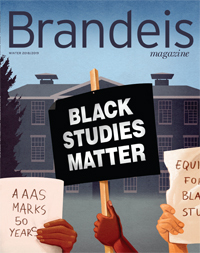 Several contributors are Brandeis alumni and faculty members. A Tel Aviv University professor who spent the 2009–10 academic year as a visiting fellow at Brandeis’ Crown Center for Middle East Studies, Susser explores the evolution of the one- and two-state options for the resolution of the Israeli-Palestinian conflict. Providing an in-depth analysis of the contentious relationships among Israel, Jordan and the Palestinian Authority, he presents an updated discussion of the long-debated notion of a two-state solution. Ultimately, he concludes that, because of deeply entrenched differences among the players, a single-state scenario cannot succeed. In this anthology, Fishbane and Sarna — who teach at the Jewish Theological Seminary and Brandeis, respectively — draw together seven essays that tell the story of a Jewish-American revival that took place in the 1870s. Dedicated to the memory of Leah Levitz Fishbane ’96 and containing a chapter she wrote as a doctoral candidate at Brandeis before her death, this book is part of the Brandeis Series in American Jewish History, Culture and Life. Whither the future of Judaism? Editor Jack Wertheimer, who teaches American Jewish history at the Jewish Theological Seminary, searched for it among young people born in the last quarter of the 20th century — those age 37 and under. In a series of seven essays — one of them by Brandeis faculty member Sylvia Barack Fishman — we encounter young Jews and their worldviews as discovered in interviews, websites and surveys. This volume is part of the Brandeis Series in American Jewish History, Culture and Life. In a burgeoning social movement known for “partnership synagogues,” women are taking a more active role in Orthodox Jewish services. This leaves some men asking, “If women are doing everything, what’s left for men to do?” Sztokman, a teacher at the Schechter Institute of Jewish Studies and at Bar-Ilan University, as well as a writer for The Forward, investigates the role of this new egalitarianism in reshaping notions of masculinity and fostering spiritual fulfillment. A major figure in the history of German-Jewish philosophy, Mendelssohn (1729–1786) was best known for “Jerusalem,” the first work to present Judaism as a religion compatible with the ideas of the Enlightenment. In this work, part of the Brandeis Library of Modern Jewish Thought, Gottlieb puts forth many of Mendelssohn’s key writings on the Bible, God’s existence and the immortality of the soul, among other topics, providing annotations and an extensive introduction with suggestions for classroom use.